What looks like a normal house on Oliver, is really an Energy Star certified home. Owner, Josh Somes purchased the house with the intent to resell it, and after hearing about the "Smallest User" competition between Cooper-Young and Evergreen, he decided to begin making the property at 2053 Oliver a sustaniable home. Somes presented the almost completed house at the monthly GreenDrinks meeting for the Memphis Chapter of the U.S. Green Building Council. The event was for chapter members but open to the public. Somes said, "I really just wanted to share with anyone who was interested." Having this event in his remodeled house was a way to show others what could be done by way of energy efficiency in the home. "As far as we know this is the first Energy Star remodel in the city of Memphis," said Somes. There are many complicated steps toward becoming an Energy Star certified home, including air infiltration, lighting usage, and other factors. One of the major decisions Somes made was which insulation to use where. He choose between closed cell insulation, which is more rigid, water resistant and should stop all air infiltration, and open cell insulation, which is more spongy and not water resistant until 4 inches. He decided to use closed cell in the exterior walls and in the crawl space, and the open-cell in the ceiling joints of the back addition. 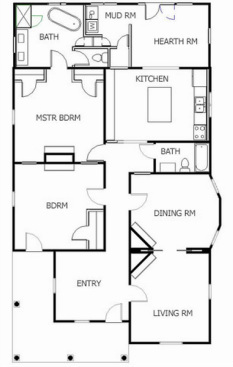 An initial decision to be made was on the floor plan. When Somes purchased the property, the house was split down the middle in a duplex style. After going through about five options, "we wanted to try and take it back to the original floor plan," he said. They wanted to "open it up to a little bit more of a modern lifestyle with the line of sight from the front to the back from the entry to the hearth room." According to Somes, when your remodeling a home like this "you have to look at it as value at resale," which is determined by number of rooms and bathrooms among other things. "The project team that's here...everybody brought something to the table," commended Somes. Each particular job was handled by a respective professional, and the team took every aspect of the retrofitting and considered how to make it the most efficient for the best price. Being mindful of the budget meant using reclaimed materials such as wall panels and recycled tile. Jack Cowan, of cowanhouse, the Energy Rater on the remodeling team, cited a 1998 study done by the appraisal organizations saying "that energy efficient improvements for every dollar reduction in utility bill would add $10 to $25 of value to the house." Even though studies seem to show there are financial benefits to renovating a home in this fashion, Somes says getting adequate appraisal of the house is difficult because the quality of the sustaniable home market in Memphis. One member of the Green Building Council said that in Nashville there was an entirely separate market for energy efficient homes, but the relators in Memphis were resistant to green changes. "It's always been problem for high performance homes is to try and get the value of the energy efficient improvements, " says Cowan. In an evaluation done by Memphis Light, Gas, and Water, the estimated annual utility bill for the home on Oliver would be $1239, which would average out to about $103 per month. Somes has not put the house on the market, but he hopes to have it completely ready within the next month or so.